The Bruker ContourGT-I 3D Optical Microscope is the result of over three decades of surface metrology innovation, experience and industry partnerships. The benchtop profiler features production-ready automation, flexible measurement angles, outstanding imaging and proven gage-capable performance. 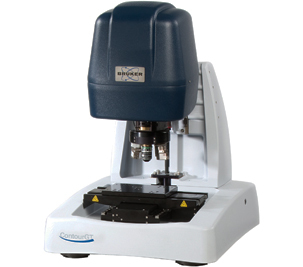 The system is fully automated and programmable to measure surface features over a range of angles with minimal tracking errors, using Bruker’s proprietary tip/tilt optical head. The ContourGT-I can be tailored to meet specific application requirements, with a wide range of accessories and add-ons, including the new NanoLens AFM module. For the first time, a full range of advanced metrology features are accessible using one benchtop system. The combination of a tip/tilt head with automated staging and objectives makes the Bruker Contour GT-I ideal for “measure-on-demand” industrial applications. The Contour GT-I also features proprietary vibration-resistant measurement technology and a unique base design with integrated air isolation, for accurate measurements in demanding shop floor production conditions. 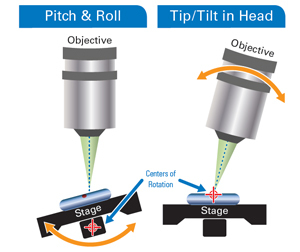 Traditional pitch-and-roll stage designs require the operator to manually adjust five axes of motion to keep the point of inspection in line of sight for measurement. The unique Bruker tip/tilt head design easily maintains the line of sight on the point being inspected.